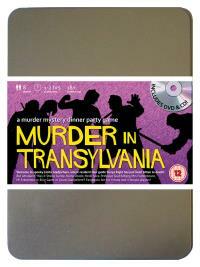 You've been invited to play the role of COUNT GLADJORHERE in Murder in Transylvania. Who killed Sonya Right? Welcome to Castle Gladjorhere, home of the world’s one and only Transvampire with a soul! Visitors from all walks of life have come to witness the thrills and chills of this genuine Transylvanian house of horror, all of which will be revealed by the resident tour guide Sonya Right. But shortly after dinner Sonya is found in her room with two small puncture wounds in her neck. Join us to find out who sucked the life out of her! Tranvestite Vampire (he’ll bite and excite!) Costume Suggestion : Your long black cape (red on the inside) keeps you warm whilst your red basque and matching fishnet stockings keep you hot! Your pointy teeth are almost as long as the heels you wear but the picture is complete with lots (and lots) of makeup. You are the world’s one and only Transvampire. However, contrary to what some people think, a Transvampire is a vampire who likes to wear dresses – NOT a vampire who is transsexual. You’ve lived at Castle Gladjorhere for 324 years and you’re proud to say it was voted Transylvania’s most popular tourist attraction for the last five years running. You are married to Sheila Suckle.